Stephen and I have a firepit in our backyard that we love having friends over and melting up some s’mores. Then one day it struck me, what if I tried to make a s’mores CUPCAKE??? I headed to the cake aisle with a mission. It’s an easy recipe, but just warning, gets really gooey when applying the marshmallow icing! But then again, it’s not fun making dessert if you aren’t licking your fingers along the way. And by the end of it, I couldn’t believe it, it truly did taste like a s’more and all it’s yumminess. Word to the wise though, what started as a fluffy top to the icing, soon the next morning, I walked into the kitchen to see the marshmallow top totally melted and dripped all over the sides. Then I realized, doh, I put the heat on last night in this chilly weather, which led to the melted marshmallow drip. But I served them at a party, and no one seemed to mind. 1. Melt the butter in a small bowl. 2. Stir together butter, sugar, and graham cracker crumbs in a bigger bowl. 3. Distribute a tablespoon of the now graham cracker crust into the cupcake holder pans, only coating the bottom. 4. Follow the instructions for the vanilla cake mix, and distribute evenly into your cupcake holder pans on top of the graham cracker crust. 5. Bake, and when done, let cool about 30-45 minutes. 6. Once cool, with an ice cream scooper, dig into the marshmallow creme and slather it on top of the cupcake. It will naturally fall to form itself on top of the cupcake. 7. 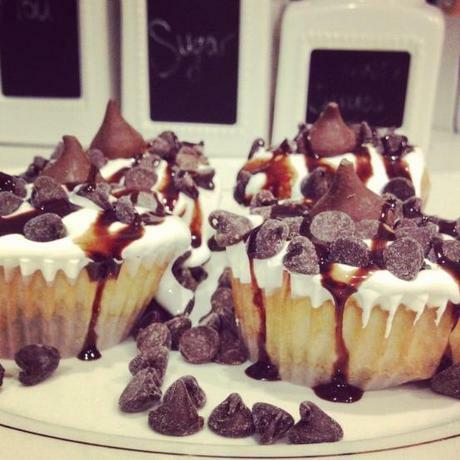 After iced, grab a handful of chocolate chips and sprinkle it around the top of each cupcake. 8. Delicately drizzle chocolate syrop on top. Then finish off with a Hershey Kiss on each one!